Looking for a fresh, spring meal full of flavor, healthy veggies, and lean protein? Look no further! This recipe is a great option for anyone– but especially people following a gluten free or dairy free diet. It’s also easy to make it vegetarian or vegan- just switch out the Mahi Mahi for tempeh. 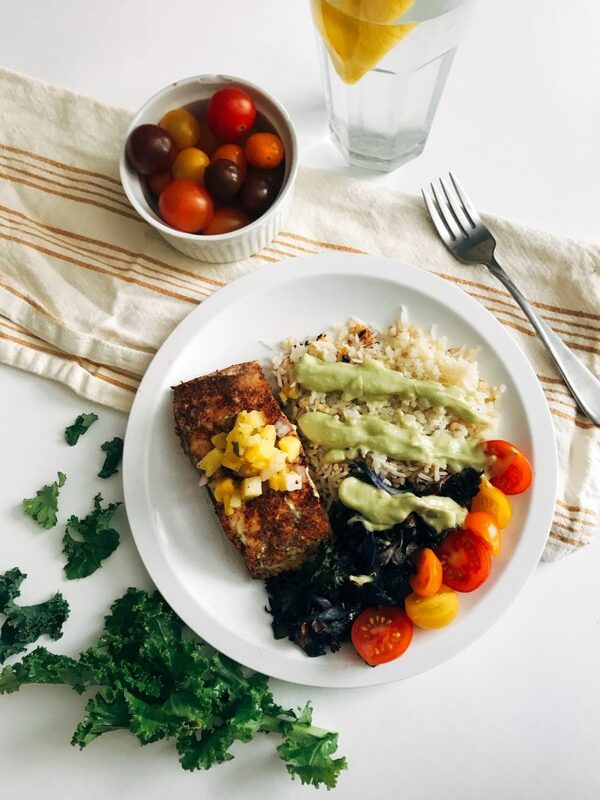 🌱Preheat oven to 425 degrees F. Season/sprinkle mahi mahi fillets with taco seasoning to taste (feel free to use more or less than 1 tbsp based on your preferences) and arrange on a nonstick baking tray. 🌱In a large bowl, combine chopped kale and red cabbage with onion and jalapeno. Add avocado and salt/pepper to taste until vegetables are lightly coated. Transfer ingredients to larger tray. 🌱Bake both trays for 22-25 minutes, or until fish is cooked through and vegetables are lightly crisp. Combine ingredients in bowl and mix with an immersion blender. If using a food processor or Ninja Blender, add oil gradually while ingredients emulsify.